I love to grow a few of the lesser known varieties, and I'm passionate about keeping some of the heritage varieties alive and well. These lovely red and white beauties are 'Dog Beans'. I really couldn't resist getting a few of these! Here are my 'Lazy Housewife' beans. These are just amazing! a really good grower, quite prolific and tasty too. I thought these would show better on a black background, so no apologies for the plug as |I had to use one of my leaflets!! And here are some 'Negritos' thought to be related to the small cuban black bean, these are the sort of small black beans you would mix with rice for a staple meal in Hispanic countries. Negritos grow as small bush beans, quite short green pods, ripening to dark red. Cinderella Goes to the Ball! It's official! Matron's giant pumpkin is going to the ball! I heard yesterday that I have been invited to compete at the RHS Autumn Show at the Horticultural Halls in London on 9th & 10th October. I really wasn't expecting this, I've never entered any sort of show. Fingers crossed! Well, tomorrow I post off my application to join in the RHS Heaviest Pumpkin Competition! Measurements and photographs have to be sent in order that they decide who gets to bring their pumpkin to the show to compete. I've never done anything like this before. I have never entered any sort of veggie show or competition. They will probably laugh their socks off when they compare mine to those crusty old professionals who have been growing giant pumpkins in their sleep for generations! I probably don't have a hope... but I've had fun anyway. Should know in the next couple of weeks. There haven't been many butterflies arount this Summer. Just in the last couple of days I think I have seen more than before. 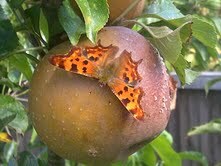 Just today I caught this Comma Butterfly sitting on one of my Russet Apples. We were enjoying the sunshine. If I wave my magic wand, do you think it would turn into a carriage to take me to the ball? Guess who Matron met yesterday?? A superstar! A genius and a very nice man... One more task ticked off my bucket list. But the one and only Queen guitarist Brian May! I've been reading up on how to grow a giant pumpkin. I thought I'd share some of the good advice that I found. For a start, make sure you have good genetics. Buy the best giant pumpkin seed you can afford. The good ones are expensive! Prepare the ground well. I started in March by making a mound of the best compost I could find. A whole barrell of kitchen compost, two bags of well rotted horse manure, a couple of bags of potting compost, several bags of lawn clippings... and leave them for weeks to settle down and relax before planting. This mound will ensure that the roots are well drained. Have enough space for this giant plant to ramble. You probably need about 10 yards in each direction, that's 100 square yards!! When the pumpkins have set choose just one pumpkin to grow to be a giant and pinch out all the others, and pinch out the ends from all the side shoots. You want the plant to put all its energy into this one pumpkin and not into growing more green leaves. Some advice is to bury some of the leaf joints with soil so that additional roots will make their way into the ground to bring up water and nutrients. Feed and water regularly. The advice varies about how much to feed and water, but that depends on the weather. In hot weather it might need as much as 20 gallons a day. I make up a comfrey or nettle feed and use a couple of gallons of feed about 3 times a week. I might also use a high potash tomato food as a foliar feed. I have heard of people feeding beer to their pumpkins..what a waste of beer! The other piece of advice was to give the pumpkin some shade from hot sun if you can. If the skin ripens and hardens while it is still growing then it might split. Some people erect a little shade tent around the pumpkin. Here I have used a couple of layers of fleece but I might give it some more shade soon. The other thing you need is lots and lots of bright sunshine and heat!.. Oh and some luck too! August can be a time on the plot when everything is just about finishing unless you plan ahead and make second and third sowings of seed. This is one of my Queensland Blue pumpkins struggling with the unpredictable English Summer. I should have a few decent sized pumpkins this year. I remembered to sow a couple of late Black Beauty courgettes in July, so just as my early sowings are struggling to keep going, I have a lovely new plant just starting out! Plenty of daylight and heat to keep this second sowing of sweet corn Lapwing going when the first crop has finished. I'm just looking to bulk up my store of seed from this little dwarf bean 'Negritos' . Thought to be similar to a cuban black bean, these little beans have jet black seeds. First time I've grown them, they are looking good. I am just in love with these little Black Pearl Chillis. Seed given to me by a fellow blogger for my Buddy Morris memorial garden. Someone else has been admiring the pumpkin too! Hard to stop him trampling all over the place! But his favourite place is to follow me into the greenhouse for a couple of cherry tomatoes!